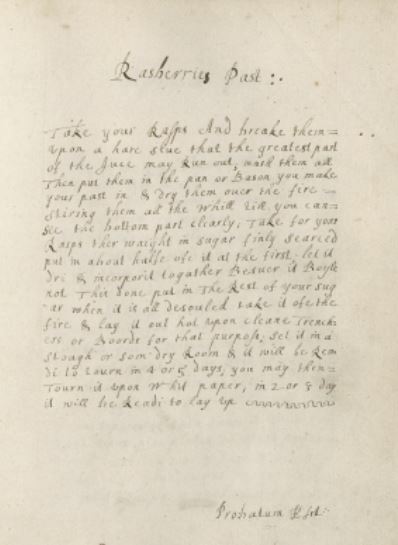 We are delighted to announce the third annual recipe transcribathon, hosted by the Early Modern Recipes Online Collective. 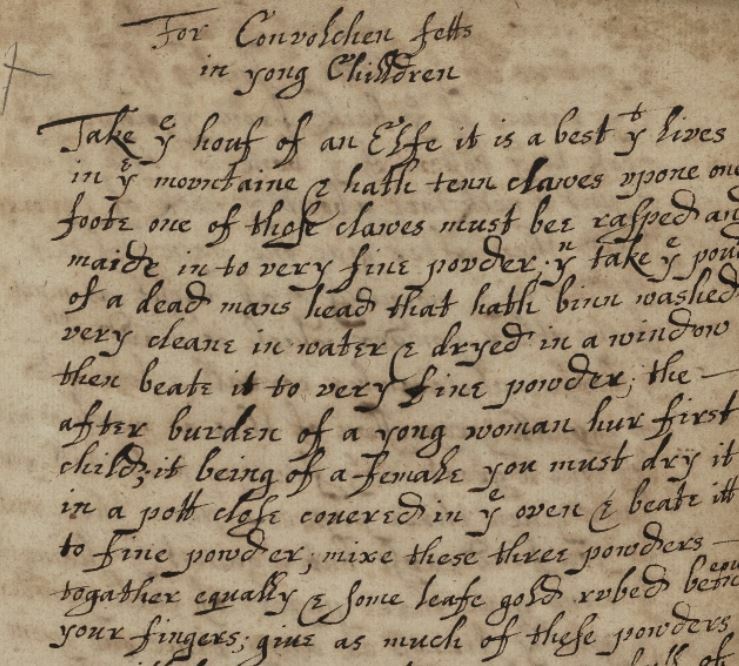 Recipe containing elf hoof from Margaret Baker’s manuscript. Source: Folger Shakespeare Library, V.a.619. Fancy taking a dip into some seventeenth-century recipes? 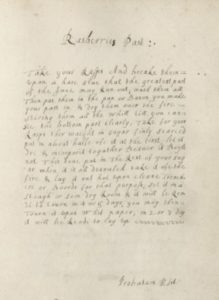 Learning a bit about reading old handwriting? And participating in a wider project with lots of other recipe enthusiasts? Then the EMROC Transcribathon just might be for you! The goal in previous years has been to take one book and finish a triple-keyed transcription of it over twelve hours. In 2016, 128 people from around the world finished Lady Castleton’s book, and in 2015, we had ninety-three transcribers complete Rebeckah Winche’s book. 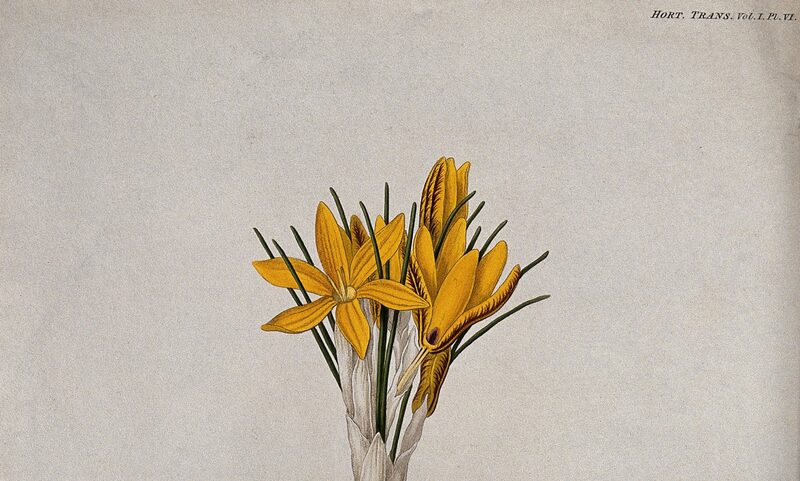 Our goal is to have 10 completed texts this year, that is 10 triple-transcribed and vetted early modern recipe books that can be downloaded in a searchable pdf. We currently have a number of texts that are either partially transcribed or fully transcribed but not completely vetted. 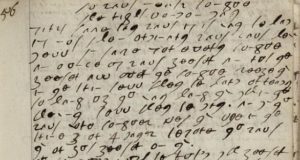 So, in working to complete these texts we will be offering a banquet of possibilities for those interested in learning more about early modern recipes and paleography. 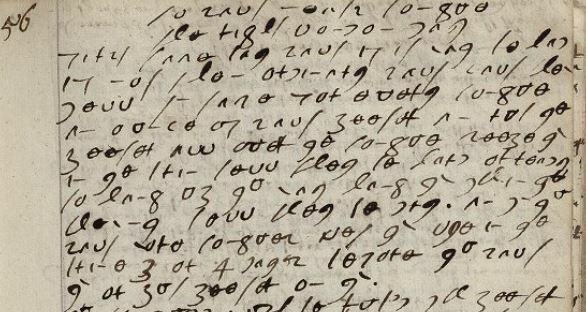 Page from Cromwell’s book, with code. Source: Folger Shakespeare Library, V.a.8. The three books on offer are: Margaret Baker, Susannah Packe, and Letitia Cromwell. I have a soft spot for Baker, having worked on her book with my Digital Recipe Books Project module last year. (The class blogged about it here and developed a contextual online exhibition about the book here.) 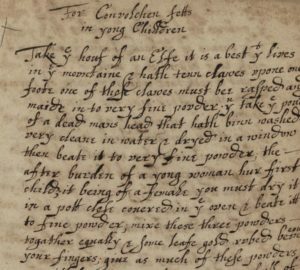 The Baker manuscript has many intriguing elements, such as excerpts from published medical and alchemical treatises and a recipe that calls for elf hoof! But the other books have their delights, as well. Cromwell has a recipe for the proverbial humble pie and a page written in code, while Packe has a great sections with candy, fruit wines, and beer. For those who like things a little easier, I recommend Baker (almost entirely one hand, fairly clear, throughout) or Packe (one easy and neatly spaced hand, and one slightly harder, messier hand). Cromwell, with its mix of hands will appeal more to those with experience. Example from Packe’s book. Source: Folger Shakespeare Library, Va215. Interested? Then please mark your calendars for NOVEMBER 7. I’ll be kicking things off in the U.K. from 12:30-4:30 p.m. GMT, both virtually and from the University of Essex Colchester campus. And several American groups will be joining in from 9:00 a.m. EST. If you’re joining virtually, please keep checking the EMROC blog, Facebook page, Twitter account (@EMRecipesOnline) and Twitter hashtag (#EMROCtranscribes) for updates, or to join in the conversation. We hope that you will let us know about your experience and tell us any interesting find or puzzling conundrum you discover!